An enormous haul of 90 pounds of rhino horn was found in a passenger's luggage during an airport stopover in Johannesburg, South Africa. And the principal investigator who detected the illegal horn was none other than a trained customs dog named Mimmo. Bloomberg News reported that Mimmo sniffed out the substance in the bags of two passengers traveling from Mozambique to Vietnam via Johannesburg's O.R. Tambo International Airport. The South African Revenue Service confiscated $407,000 worth of horn - the airport's largest seizure to date. It's not the first time that canines have been used to root out poaching. Earlier this year, a team of anti-poaching operatives was formed in Ol Pejeta Conservancy, a sanctuary in Kenya, and its members all search on four legs for wildlife crime . Crawford Allan, the senior director, of TRAFFIC, told The Dodo that these programs can be invaluable. "We have learned from the detector dog programs that we are supporting that a dog's nose can outwit organized crime smuggling attempts very successfully," he said. "They are powerful resources for law enforcement in the fight against trafficking in rhino horn and elephant ivory in particular." 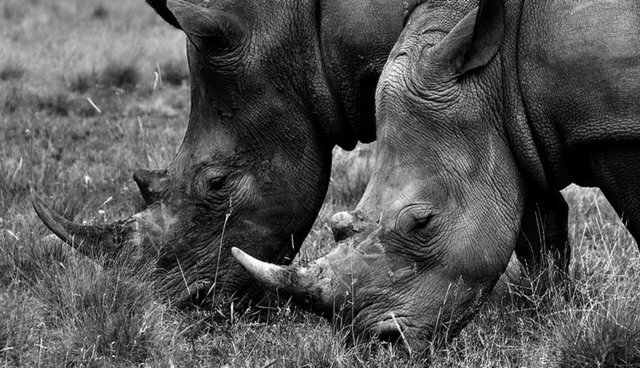 The illegal trade in rhino horn has decimated populations in recent years. In 2013 alone, more than 1,000 rhinos were killed in South Africa for their horns, which are usually ground up and used in traditional medicine. That number was an increase of over 50 percent from the previous year, which saw 668 rhinos poached. The year before that saw even fewer - 448 in 2011.